On the weekend of the 19th of may two members of the Maltgeeks group went to the Whisky Lounge annual event in Stratford Upon Avon for some whisky fun. The venue was nice and intimate in size, with 16 stands all around with the SMWS holding the centre of the room and commanding the respect and attention as entitled to them by any whisky lover. We sampled many drams (mostly new things we have not tried before , but also some old and familiar friends) during the visit and enjoyed some surprises (for better and for worse) from the ones we did not know. We debated if we should sign up to the scotch Malt Whisky society(SWMS) but the price was a bit too high at the time , though we did agree that it is something we have to do in the future. When we left it was with high spirits and a joyous step, and not just from the golden nectar flowing in our veins. If you ask a large number of people what does whisky (or whiskey) means to them, and what is the first thing that comes to their head when they hear the word, 9 out of 10 people will talk about the drink’s characteristics,the sensations, some might talk about the hangovers they had, but a rare few will talk about the music that the word conjures in their mind. To me the word brings to mind music. Music not in the traditional way of instruments playing a score, but more of the music of nature: the whisper of the wind blowing over the hills of Northern Scotland, the mellow flowing waters of the Spey river, the roar of crashing ocean waves onto the pier near the town of Tain near the Glenmorangie distillery and even the braying of the bulls in the pens. The musical sounds of Whisky country! It is something that all those that travelled Scotland to savour this wonderful liquid experience but may not take the time to notice and appreciate; it is a sensation to be absorbed and appreciate slowly, much like a good dram. Most distilleries have a stream or pond they use when making whisky, and each plays its own tune. Some streams are slow-churning flat stream-beds and some are thunderous cascading waterfalls. It is sometimes difficult to hear the music around you when there are distractions such as other visitors, cars and any other source of noise, but in those rare moments of silence and social isolation, it is then that the echoing sound of the place can be heard and sip into your mind, as slowly as the flavours of the dram descend on the palate in the first taste, that is how the music of a place enters your ears and your mind: bewitching, mesmerising and beautiful. This has dawned on me in the Glen Grant distillery I visited a long time ago, the drink itself was not to my palate, but the gardens and the music of the stream with its surrounding ambiance enticed me deeply, I felt that the place was so “right”. It was fulfilling in a sense that other distilleries have not been until then. Since then, I always strive to find a moment to listen to the home of the whiskey, and once I heard the music of its birthplace, its place in nature’s symphony, only then do I step inside and experience what the musical composition tastes like; and if I didn’t hear it, I go inside and see maybe the drink will show me the song. So in the next time you travel Scotland, take the time to listen to the land and it’s music. The Arran Sleeping Warrior 11 years old , was given to members of the Maltgeeks while on tour in the distillery , it is an 11 years old bottling in a cask strength of 54.9% , and one of only 6000 bottles made. In some circles 6000 units is considered a large number, but in Whisky 6000 bottles is a very low, and there for the privilege of having such a limited dram is something we appreciate and savour. When we approached the tasting of this bottle, we took the time to enjoy it as once it is gone , chances are we will not be able to got another one. Nose: The Aroma draft is easy and smooth providing scents of Leaves, Almonds ,Moss and Caramel. Very gentle and interesting in it’s combination. Colour : Light brown , slightly golden in hue , clear with a very smooth swirl. Palate : The dram is very powerful, with a strong kick on the tongue and a burn in the throat , if you drink it unprepared if will cause you to choke due to it’s spirit content. Once you are past the cough seizure the traces are :Caramel,Peppers and Bananas. Nose:The nose is not affected by the added water,if anything it feels as if the water acts as a re-laxer to the aroma as it is drifting out even slower but still full and still powerful. Colour:The colour becomes even a deeper golden hue with a shimmering quality , but retaining the smoothness it had before. Palate: The brunt force of the dram is diminished to a more managed and “tame” dram , it is now gentle in the mouth but still provides the deep burning sensation in the gut and a easy after taste in the palate. Traces of Almonds ,Caramel,Bananas and Apricots . Conclusion : This Whisky is a very lovely Dram , but it requires water. At a cost of £57.95 it was a very good buy, but now out of stock in the major stores. It will go well with a Rabbit or Game . 3.25 out of 5 . As part of the trip to the Isles , a stop in the Isle of Jura was a must and so was the acquisition of a bottle. Colour: Light Tea , or more like a tea with honey , but clear through. Nose : light and easy on the nose ,faint traces of smoke easy enough to not disturb those that dislike smokiness in the whiskey ,apricots, vanilla and very faint trace of mint. Palate : gentle on the tongue ,smooth and slow in producing the warm glow in the stomach without any burn or after burn as it goes down. When going down it is leaving traces of caramel ,pines and almonds in the mouth . Colour : A small drop of water does not affect the colouring much , slightly lighter golden hue. Nose : The drop of water brings out the aroma of Bananas,Figs, and some traces of sea front smell , on the nice side the traces of smoke is completely gone. Palate: The smoothness of the dram , with the water added turns it to a powerful bland drink, the warm glow is still present but the mouth is empty of the sensations of the dram. Conclusion : A very mellow dram that stands on it’s own with out any need for water ,most stores indicate this bottling as out of stock , which is sad since this dram can go well with almost any event . 4 out of 5 . The name “Tobermory” is derived from the Gaelic “Tobar Mhoire”, which means “Well of Mary” and relates to the well and chapel of St Mary – there was a small Christian settlement in Tobermory from early times. The original name for the distillery, Ledaig (pronounce Led-chig) is also Gaelic and means “Safe Haven”. 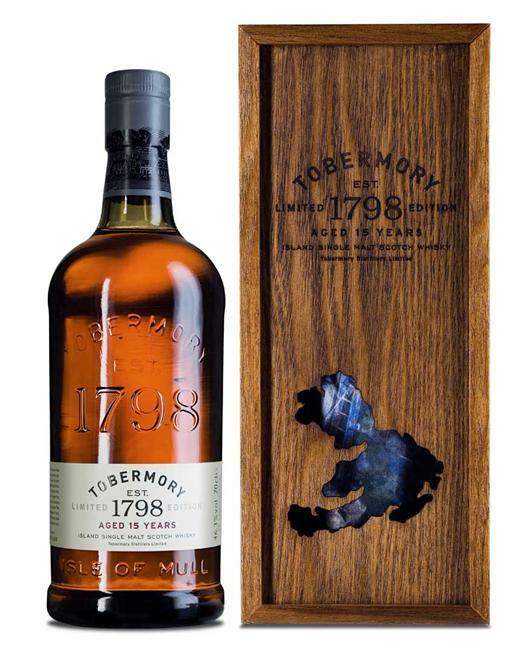 Today Tobermory distillery produces two different styles of single malts. The first one is a lightly peated malt called Tobermory. The second is an extremely peaty malt called Ledaig. Colour: Honey gold , smooth and clear with a fluid swirl . Nose : Gentle on the nose not over powering but dissipates very quickly. Traces of Pines, Peat, Vanilla , faint Peppers. Palate : Nice mellow burn , and a slow after burn in the gut , lingering traces of pines and caramel , the tastes evaporate from the mouth very quick . Colour : A drop of water lightens the colour , making it a shade of pale honey. Nose : The aroma is getting a mixed treatment, with the more prominent scents feeling repressed with traces of vanilla and cinnamon coming out . Palate :The burn is still there but takes more time to come out, but once it is out it is slow and building nicely , going down smooth and providing a good burn in the stomach. Traces of Caramel , Pine , Vanilla and Peppers. Conclusion : very mellow dram with a nice kick and burn, going down smooth but can go to the head fast. For a price of £75 it is bit over priced (but it is a limited edition) , a good drink for the end of the night 3.6 out of 5 . During the weekend I had some errands to run in London , things I have been putting off for a while. So while I was doing my “rounds” I walked in the the Royal Mile Whisky shop for a chat and catching up . I spotted some bottles I’d probably will add to my collection after pay-day , and once I finished the shelves round I started talking to the guy at the counter , We mentioned some new drams coming out and tasting of old things , and in all of that I told him about the disappointment from the DeerStalker that I bought from the Edinburgh branch. He said he was sorry to hear that a bottle I got that their shop and offered me a sample to balance it out , I was surprised and jested that I can see several things I’d Love to sample , but he would not open them for that , then I asked what he has open that he thinks would be nice , so he gave me a Bruichladdich 10 year old 43% . It is a very nice dram , with a very intense and nice burn good nose and a lovely after taste. This is not a full tasting notes as I did not write the sensations of this dram , but I found it a very pleasant dram . I’ve also talked about bringing a sample of the Healey and the Imperial I have at home for the staff to taste , now I need to find the time . A while back I visited the Healey’s Cornish Cyder Farm and had a wonderful time , they produce some wonderful Cyder and we took some home to try ( very short try indeed as one of the bottles was opened and consumed the same night ). During the visit I learned that they are in the process of making their own brand of whiskey Hicks & Healey Cornish Single Malt Whiskey , so I made arrangements to purchase one . Yesterday the package arrived and it is so exquisite I am thinking of buying another one so I may be able to open and taste it .